Fumarolic activity was observed on the morning of 19 March. A white plume was rising from the summit crater during the 3 hours the observer was on Nevados de Chillán Volcano, 160 km to the S. The only recorded eruption at Descabezado Grande, in 1932, was from a crater at its NE foot. Weak fumarolic activity has been reported on the W slope at about 3,500 m, but none had previously been observed in the main crater. Volcán Descabezado Grande is a late-Pleistocene to Holocene andesitic-to-rhyodacitic stratovolcano with a 1.4-km-wide ice-filled summit crater. Along with Cerro Azul, only 7 km to the S, Descabezado Grande lies at the center of a 20 x 30 km volcanic field. A lateral crater, which formed on the upper NNE flank in 1932 shortly after the end of the major 1932 eruption from nearby Quizapu volcano on the N flank of Cerro Azul, was the site of the only historical eruption. The Holocene Alto de las Mulas fissure on the lower NW flank produced young rhyodacitic lava flows. Numerous small late-Pleistocene to Holocene volcanic centers are located N of the volcano. The northernmost of these, Lengua de Vulcano (or Mondaca), produced a very youthful rhyodacitic lava flow that dammed the Río Lentué. Hildreth W, Drake R E, 1992. Volcan Quizapu, Chilean Andes. Bull Volcanol, 54: 93-125. There is no Deformation History data available for Descabezado Grande. There is no Emissions History data available for Descabezado Grande. 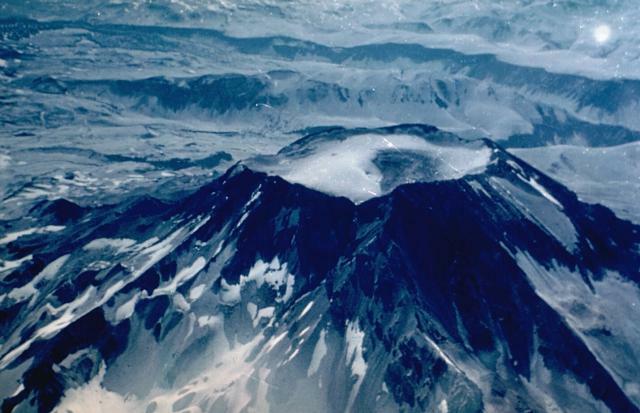 The summit of Descabezado Grande volcano is truncated by a 1.4-km-wide, ice-filled summit crater, giving rise to its name, which means "Large Headless Volcano." 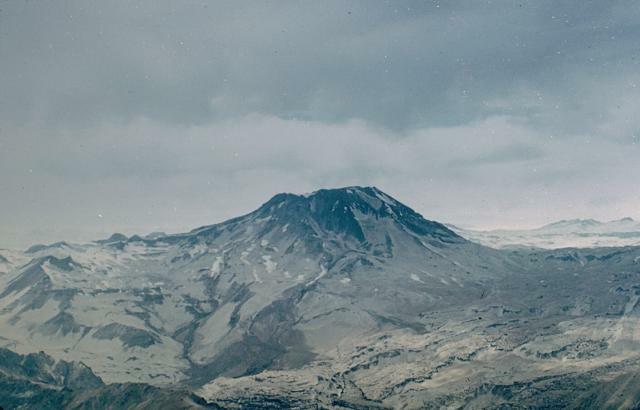 The only historical eruption of this late-Pleistocene to Holocene volcano, seen here from the west, occurred in 1932 from an upper NNE-flank vent. The 1932 crater lies out of view below and to the left of the notch at the left side of the summit crater. Volcán Descabezado Grande, seen here from the west, is a late-Pleistocene to Holocene stratovolcano with a 1.4-km-wide ice-filled summit crater. The Holocene Alto de las Mulas fissure on the lower NW flank (out of view to the left) produced young rhyodacitic lava flows. A lateral crater formed on the upper NNE flank in 1932, shortly after the end of the major 1932 eruption from nearby Quizapú volcano. This was the site of the only historical eruption of Descabezado Grande. Descabezado Grande (center) and Cerro Azul (middle right), seen here from the NW, are the most prominent features of a large volcanic field. 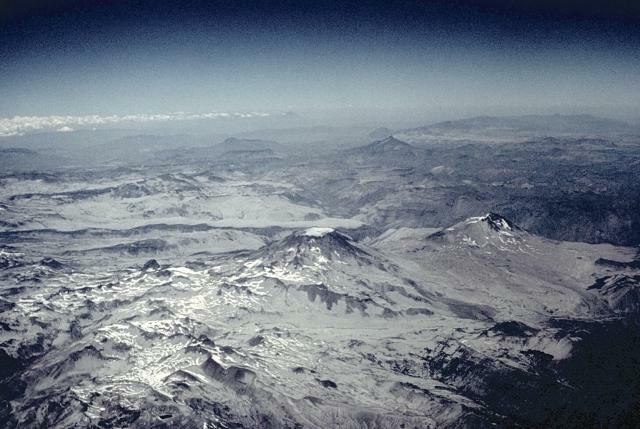 The most active of the two large stratovolcanoes is 3810-m-high Cerro Azul. Quizapú, a vent that formed in 1846 on the northern flank of Cerro Azul, was the source of one of the world's largest explosive eruptions of the 20th century in April 1932. The eruption created a 600-700 m wide crater and ejected 9.5 cu km of dacitic tephra. The only historical eruption of Descabezado Grande took place later in 1932. Photo by Jeff Post, 1988 (Smithsonian Institution). 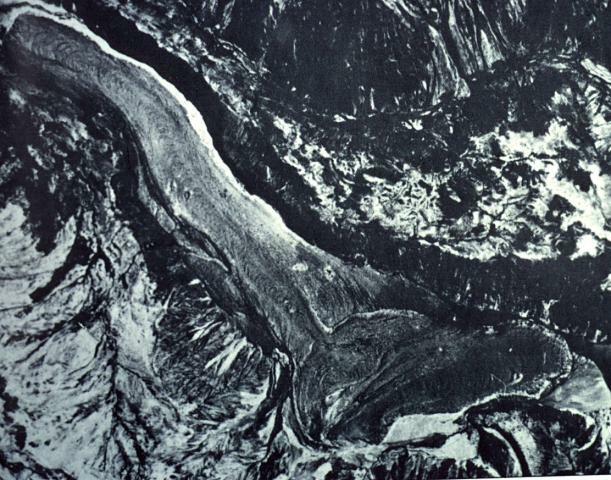 The 2048-m-high Mondaca lava dome (bottom center) produced a large youthful rhyodacitic lava flow that traveled north and dammed the Rio Lontue, eventually reaching 7 km to the NW (upper right). This eruption may have taken place during historical time, possibly during the 19th century. The solitary small Mondaca lava dome is located NNW of the Descabezado volcano complex and west of the Calabozos caldera. There are no samples for Descabezado Grande in the Smithsonian's NMNH Department of Mineral Sciences Rock and Ore collection. IRIS seismic stations/networks Incorporated Research Institutions for Seismology (IRIS) Data Services map showing the location of seismic stations from all available networks (permanent or temporary) within a radius of 0.18° (about 20 km at mid-latitudes) from the given location of Descabezado Grande. Users can customize a variety of filters and options in the left panel. Note that if there are no stations are known the map will default to show the entire world with a "No data matched request" error notice. Large Eruptions of Descabezado Grande Information about large Quaternary eruptions (VEI >= 4) is cataloged in the Large Magnitude Explosive Volcanic Eruptions (LaMEVE) database of the Volcano Global Risk Identification and Analysis Project (VOGRIPA).